In the days of the Hawaiian Monarchy and before, Hawaiian Royalty used to maintain beach houses along the narrow stretch of beach on Oahu known as Waikiki (Spouting Water). Much of the land, however, was marsh and wetlands that flooded often when heavy rains swelled the Manoa and Palolo Streams. It was not until the 1920's when the Ala Wai Canal was dredged and the springs, ponds, and marshes filled that today's Waikiki began to take shape. Few realize it, but today's Waikiki is actually a peninsula jutting out from Kapi'olani Park to the southeast and enclosed by the Ala Wai Canal on the east and northwest and the Pacific Ocean on the south and southwest. Waikiki is approximately two miles long and a little over a half mile at its widest point. The 500-acre Kapiʻolani Park and Diamond Head Crater mark the southeastern boundary of Waikiki. Kalakaua Avenue runs the entire length of Waikiki and along it you'll find Waikiki's most famous hotels. 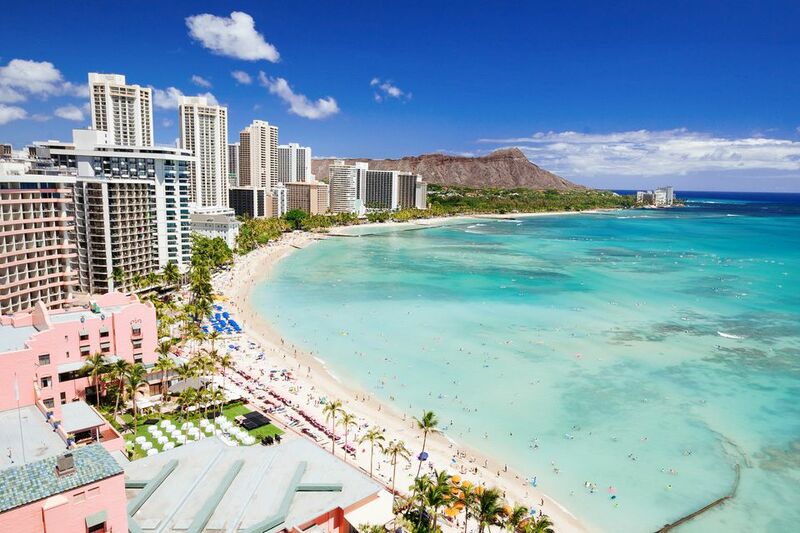 Waikiki offers the perfect climate for one of the world's most popular vacation destinations. It has some the fairest weather you will ever find. Most days the temperature is between 75°F and 85°F with light breezes. Annual rainfall is less than 25 inches with the most rain in the months of November, December and January. The temperature of the ocean varies from a summertime high of approximately 82°F to a low of about 76°F during the coolest winter months. Waikiki Beach is perhaps the world's most famous and most filmed beach. It actually consists of nine individually named beaches stretching along the two miles from Kahanamoku Beach near the Hilton Hawaiian Village to the Outrigger Canoe Club Beach near the foot of Diamond Head. The beach today is almost entirely artificial, as new sand has been added to control erosion. If you're looking for privacy, Waikiki Beach is not for you. It is one of the most crowded beaches in the world. Waikiki Beach is a popular surfing spot, especially for beginners since the surf is quite gentle. The waves rarely exceed three feet. Locals arrive at the beach before sunrise and swim out to catch the first waves of the new day. Since the 1930s surfing lessons have been given at Waikiki beach. It’s the perfect spot where tourists have the chance to learn about this ancient sport. Today local beach boys will still show you how to ride the waves. Board rentals are readily available. Waikiki is home to over 100 lodging establishments with over 30,000 units. These include over 60 hotels and 25 condominium hotels. The precise number is ever changing as former hotels are converted to condominium units. New construction continues every year. The first hotel in Waikiki was the Moana Hotel, now the Moana Surfrider - A Westin Resort. The most famous hotel is the Royal Hawaiian, the "Pink Palace of the Pacific" and home to the world-famous Mai Tai Bar. Many believe that it is at sunset that Waikiki really comes alive. Hundreds of restaurants offer almost every imaginable cuisine. Almost every restaurant offers its own take on freshly caught local fish. La Mer Restaurant at Halekulani is one of Hawaii's top rated restaurants. Kalakaua Avenue comes alive with street performers and the lounges of most hotels offer live Hawaiian music. The Society of Seven has headlined the Outrigger Waikiki showroom for over 30 years. The choices are endless. The newer Legends in Concert Waikiki show "Rock-A-Hula" at the Royal Hawaiian Center features performance artists who pay tribute to such stars as Elvis Presley, Michael Jackson, and others. It is a really great time. Waikiki is a shopper's paradise. Kalakaua Avenue is lined with numerous designer boutiques and almost all of the hotels have their own shopping areas. For foreign visitors, the DFS Galleria Hawaii is the only place in Hawaii to enjoy duty-free savings on the world's leading luxury brands. The newly renovated Royal Hawaiian Center is a huge mall that is centrally located on Kalakaua Avenue near the Royal Hawaiian Hotel. King Kalakaua created Kapiolani Park in the 1870s. This beautiful 500-acre park is listed on the State's Historic Register as many of its exceptional trees date back over 100 years. Kapiolani Park is the site of historic Diamond Head, the 42-acre Honolulu Zoo and the Waikiki Shell, which is home to many outdoor concerts and shows. On weekends there are art shows and craft shows. If you're looking for that perfect souvenir, inexpensive jewelry, and clothing, or Hawaiiana, check out one of these craft shows. Within the park, there are tennis courts, soccer fields, an archery range, and even a 3-mile jogger's course. Diamond Head is one of Hawaii's most famous landmarks. Originally named Leahi by the ancient Hawaiians who felt it looked like the "brow of a tuna", it received it's more famous name from British sailors who saw its calcite crystals in the lava rock glimmering in the sunlight. A hike to the summit is moderately difficult but is rewarded by amazing views of Waikiki and eastern Oahu. Over 750,000 people visit the Honolulu Zoo annually. It is the largest zoo within a radius of 2,300 miles and unique in that it is the only zoo in the United States originating from a King's grant of royal lands to the people. Encompassing 42 acres in Kapi’olani Park, the zoo is home to hundreds of species of mammals, birds, and reptiles, many of which cannot be found on the mainland. The zoo's African Savanna offers a rare opportunity to view many species in their natural habitat. The exhibits, programs, and research focus on the aquatic life of Hawaii and the tropical Pacific. Over 2,500 organisms in our exhibits represent more than 420 species of aquatic animals and plants. Every year, roughly 350,000 people visit the Waikiki Aquarium.